Don Lemon appeared to have a bit too much of the holiday spirit in him during CNN’s live New Years Eve celebration broadcast. 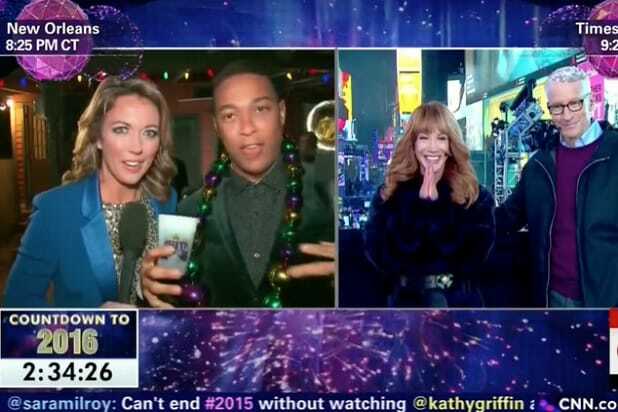 Lemon appeared live on the air from New Orleans with fellow CNN anchor Brooke Baldwin, while Kathy Griffin and Anderson Cooper were in Times Square. “I have to say, Kathy–I have to say nice rack,” Lemon said at one point. “I didn’t know you had all of that.” After making the comment, Baldwin took Lemon’s cup away and said, “I’m cutting him off!” Check out video of the exchange below. Lemon also took to Twitter to get fans to vote on whether or not he and Baldwin should get into a hot tub at the party they were broadcasting from, with Lemon eventually taking a dip. Also Read: Don Lemon Asks Donald Trump: Are You Racist, Bigoted or Islamophobic?